Yes - this is finally it - the Palm Springs 1/2 marathon 2012 - so please stay with me and humour my other interests! The day started early with a 5am alarm, got up quick in time to have breakfast and digest this before the race started at 7am. At that time it was a chilly 10C (50F) but the early start is necessary as those of us that will be plodding around after 2 hours will still be running when the heat rises to a sticky 21C(70F) plus. The race started in Ruth Hardy Park near to where we live. This was one of the parks I mentioned a couple of weeks ago, decimated by the storm. The grounds staff have worked hard and the park has largely been cleaned up apart from the few crooked stumps, like gravestones, sadly marking deceased trees. However there are still enough trees that the race starts in the shade underneath olive trees. Sounds wonderful but it messes up the signal to my Garmin - a wonderful little GPS device that tells me how slow I'm running! The first 1/2 marathon I ran was over 30 years ago when I was Grounds Manager at Reading University. The race started and finished on the university campus so I was involved in the organisation for some years. To my surprise the runners were just ordinary people of all ages and I decided to enter and finished. 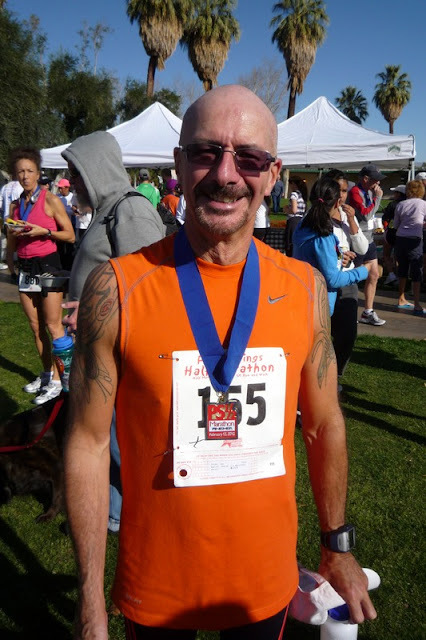 I didn't run another race until I passed my 60th birthday a couple of years ago, although I have always jogged for general exercise and found this stimulating. Running always lifts my moods and I find it valuable thinking time when I am working on my writing projects. Its also the ideal opportunity to peer over people's walls at their gardens! The race route in Palm Springs is beautiful, passing through the old Movie Colony District past the past homes of celebrities such as Elvis Presley and Marilyn Monroe. 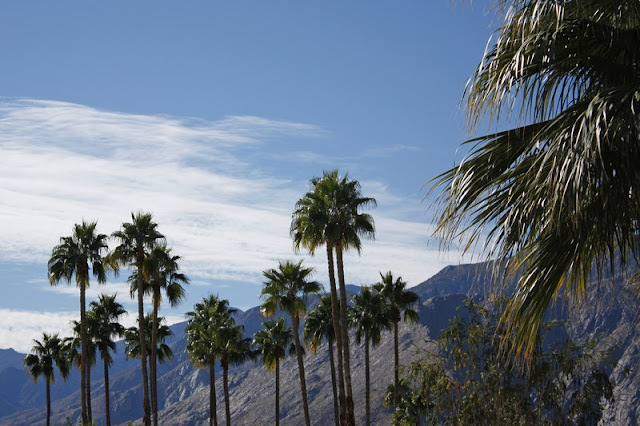 There is one long steady hill of nearly a mile that passes by beautiful desert gardens set against the San Jacinto Mountains and from there its a slow downhill back to the park. Bougainvillea, Lanatana, Citrus trees and palms line the route. It was a perfect morning with the mountains tinted pink from the sunrise and a dusting of cloud on the top just like icing sugar on a cake. Unlike the popular Robin Hood Marathon in Nottingham, the race route is almost deserted - too early for the residents to observe on a Sunday morning! Last year I didn't finish - having to abandon with a knee injury at less than 3 miles - so humiliating having to ask a police officer to borrow a phone requesting a panic pick-up by my partner Philip. This was followed by weeks of excruciating hobbling with a cane before I was even able to easily walk. The T-shirt was unworn and given to a charity shop - I hadn't the heart to wear it not having finished. This was followed by a broken foot, fortunately the opposite leg which meant six weeks in plaster and on crutches. Enough said - I'm fit again! Champagne brunch followed ($1 a glass) and now it time for a rest! Many congratulations, I admire people who run, sadly (with relief) I am unable to run due to a knee brace, but do walk alot! Thanks Libby! 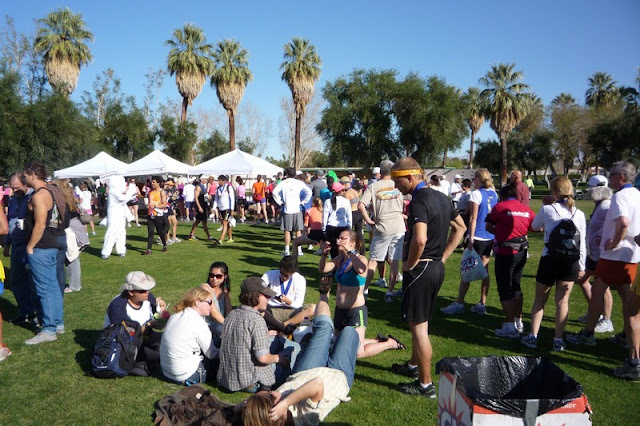 This is very much a retirement area so the average age of runners is much older. This year there was a special Bionic Award for anyone competing with either a hip or knee replacement - so no excuses out here!